A takeout favorite gone veggie and flavor boosted. Hearty pulses with loads of texture. Disclosure: This post was sponsored by USA Pulses and Pulse Canada. Take the Pulse Pledge here for the 2016 International Year of Pulses! As an introduction to this recipe, after I made it Chris looked at me and said "This is my new favorite way to eat chickpeas. I don't even need chicken in this dish anymore". That's like a five star review right there. And he's right. When I built this recipe concept I greatly underestimated the potential. Make it tonight and tip yourself instead of ordering take out. Tips in this house are also accepted as adult beverages. 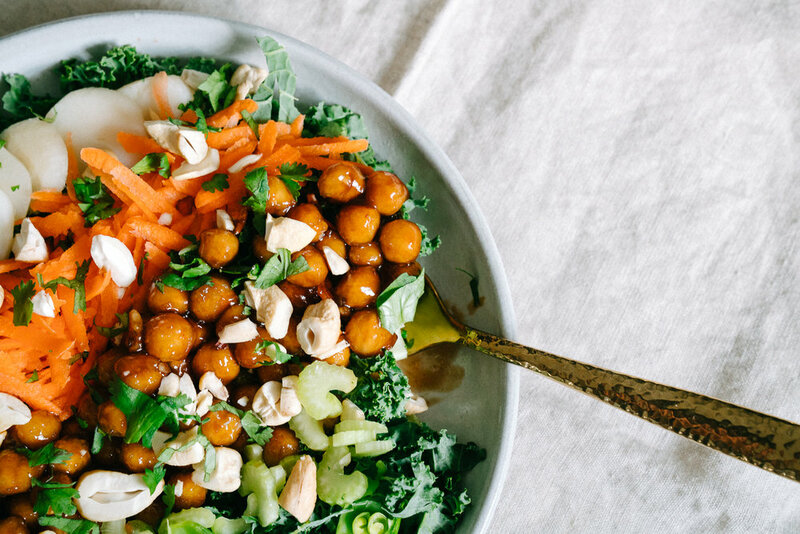 Healthy 'bowl' recipes had their moment in 2016. A great 'bowl' has lots of color and texture and a good sauce. If there's no good sauce or dressing there's nothing tempting to finish off the bowl base. Today's sauce is sweet and sour sauce. I bet you if tossed your most 'meh' veggie in this sauce, you'd crave it. If you don't love kale, or if you don't love broccoli slaw, add it to this recipe. I think you'll surprise yourself. While this recipe is awesome with chicken, here's why we are making it with pulses: we're on the last bit of the International Year of Pulses. Back in January when I headed to Napa Valley's Culinary Institute with USA pulses, I ate lots of great pulses and was fed some amazing nutrition studies. The most important one for you here is a 2016 study that found that participants who ate 3/4 cup of pulses a day for six weeks lost more weight and body fat percentage than people who skipped their pulses. So to be ultra clear: if you eat more pulses, you lose more weight. Think about how you could be adding those pulses to your eating routine instead of just thinking about what to take away. And why WOULDN'T you want to eat pulses when you have recipes like this? My last recipe nugget here for you before we get down to the directions is to consider different textures in your bowl. Sure, I could have chopped the carrots and water chestnuts and celery and snap peas....but where's the fun in that? I really feel that the more variety you give yourself in this bowl with healthy ingredient shapes and textures, the more you're going to want to come back to this recipe. Take five extra minutes and slice and shred and chop. You can even keep pre cut veggies of different shapes in glass storage containers in your fridge to make this extra easy for leftovers. 1 small handful fresh cilantro leaves, chopped. /// Directions /// Add sugar, vinegar, soy sauce, garlic salt, tomato paste and sriracha to a pan on the stove over medium heat. Stir to combine. In a small dish, add 1 Tablespoon corn starch and 2 Tablespoons cold water. Mix cornstarch and water and pour into sauce mixture. Stir to combine and bring to a boil, then remove from heat. Drain chickpeas from can (you can easily make your own from dried!). Pat dry and toss with remaining 2 Tablespoons corn starch until all chickpeas are covered. In a large sauce pan, add coconut oil over medium heat. Once oil is melted and pan is hot, add chickpeas and stir occasionally until chick peas are lightly browned. Add sauce to pan with chickpeas and stir to coat. Turn off heat. Prepare bowl of veggies and add chickpeas.